Well, maybe that’s going too far. Word War Z isn’t necessarily a GREAT movie. But its pretty darn decent. At least in comparison to what I went in expecting. This film had similar issues during production that Jack The Giant Slayer ran into. Something along the way caused it to go off the rails that delayed the release, forced the filmmaker’s to rethink Act 3, which in turn caused more expenses in post because more FX work had to be done, or lots of FX work that was complete or in progress had to be thrown out the window (my guess is the latter). But, unlikely Jack, I think the changes could have saved the film from the horrible death of being a forgotten zombie flick. I would say the saving grace of this film is probably director Marc Forster. I had the honor of working with him on The Kite Runner. He’s soft-spoken, unassuming, and when he speaks, his thoughts and direction are coherent and clear. And this is when dealing with the FX guys. I can only imagine that this transfers to working with the actors, which is what his strong suit is — character pieces. Monster’s Ball, Finding Neverland, Stranger Than Fiction, The Kite Runner, but not-as-much Quantum of Solace, all benefit from deep character work without a lot of pizzazz. 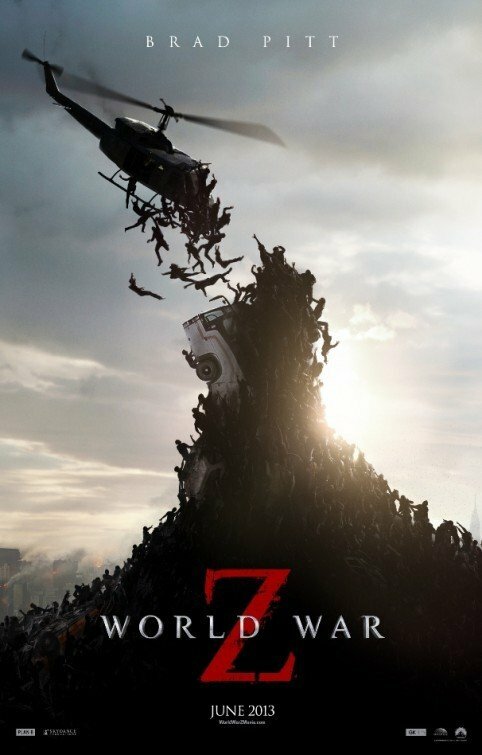 I was surprised to see Forster attached to such a popcorn, broad-scope, epic flick like Word War Z. How on Earth was he going to exercise his strengths when such a story couldn’t possibly allow us to get personal with the characters? In my opinion, he does. And this is what makes the film enjoyable. The plot is very basic, and as a pitch would sound so cliché as to roll Max Brooks out the studio door on the rolling eyes of the producers. Ex-UN tough guy is called back into action to do one last mission to save the world — a world overrun with zombies. However, with more details, the plot thickens. Ex-UN tough guy Gerry Lane has a family — his wife and two daughters. They have a loving relationship, and they are lovable. While driving through Philly, the world quickly goes haywire as infection spreads quickly through the world population, turning everyone into flesh-eating zombies — nothing new there. But, Lane knows how to survive in extreme situations (albeit, not zombie situations). He manages to get himself and family to a pickup point where his UN contact has arranged for a helicopter to get them out of there and on to a naval fleet protected 200 miles off the coast. Like all good Campbellian heroes, Lane refuses the call to go back into action because he wants to stay with his family. Patriotism doesn’t work. Be a team player doesn’t work. So, the authorities basically strong-arm Lane by saying that if he doesn’t play, he and his family will be returned to Philly to fend for themselves. And Gerry Lane makes the decision to step into the first part of Act 2, which is a series of zombie events in different countries trying to sleuth out the cause and/or cure for the problem. The stakes become higher and the scope bigger for each zombie attack (as they should). But Forster continues to keep the main thrust of the story personal and contained: This is about a man trying to get back to his family — and the family that desperately wants him to come back. After globetrotting and fighting zombies who manage to scale walls by creating ant-like towers of zombies, Gerry finds himself in Act 3 (the one that was reworked), and the film down shifts into a very different kind of movie. It moves from outright chaos, to the controlled tension of the first prototypical zombie films. I would normally call this out for a number of reasons: Act 3 feels like an entirely different film, and it breaks a cardinal rule that you always crescendo a film to the climax — you never take a step back in scope, tension, or stakes. But for some reason, I didn’t mind it in this film. Could be the directing, could be the performances, led by a surprisingly controlled Brad Pitt, could simply be that I cared about Gerry Lane and whether he was going to get back to his family. So, I can justify the decrease in external stakes, by saying that the film shifts into a crescendo of internal stakes. Not to get to heady on this, because it doesn’t deserve THAT much, but this is like The Odyssey — a hero faces a series of tests and tasks, all the while trying to get back to his family. It does matter whether how ferocious the Cyclops is, or how enticing the Sirens are, just as long as you don’t lose sight of the hero’s ultimate goal. However, with this analogy comes the greatest flaw about World War Z. I don’t get the sense that Gerry comes out a changed man at the end. He is an awesome badass (albeit retired) at the beginning of the story and he’s a great Dad and husband. And at the end, he is the same awesome badass and great Dad and husband. This is bad from a storytelling standpoint. We don’t ever question Gerry Lane’s ability to succeed because of his own flaws that he has to overcome. We only question it because the external odds are against him. The visual effects, predominantly from MPC and Cinesite (in one of their last films), are out of control ranging from the obvious hordes of zombies to more subtle environment and set extensions. For a further breakdown, check out my buddies at FXGuide. Photography is gorgeous, and even though it goes hyperkinetic in places, at least the movement is justified. Cinematographer Ben Seresin seems to have learned from Forster that there are times to be kinetic, and there are times to calm down and let the actors act. He certainly didn’t learn it from frequent collaborator Michael Bay. The story’s pacing also benefits from the ebb and flow between crazy zombie stuff and silent human stuff. This is a welcome break from full on sensory assaults that many films are turning to today. I’m sure that this will be flung into the pile of zombie movies to be torn to shreds by zombie aficionados arguing deep into the night about slow zombies versus fast zombies versus brain eaters versus vocal zombies versus viral versus voodoo. The discussion continues. But me? Didn’t blow me away, but I kinda enjoyed playing Zombie Jenga.